The objective of this paper was to develop a method based on infrared spectroscopy to compare mineral content in soils and apply it to evaluate soil mineralogical variations in pairs of inter-patch and patch soils in a semi-arid area. Mixtures of several minerals were analyzed by infrared spectroscopy, the second derivative of the spectra was calculated and the spectra normalized respect to calcite or quartz signals (711 cm−1 or 800 cm−1 respectively). The intensities of representative signals of each mineral were related to their concentration in the mixtures. Pairs of patch and inter-patch soils from five different sites were analyzed by this method. Elemental analysis and total lime analysis were performed in some soil pairs. Soils were dominated by calcite and quartz, or by montmorillonite and kaolinite. Inter-patch soils were richer in calcite and poorer in quartz or clays than patch soils. Calcite losses in patch soils might be related to soil acidification by CO2 from respiration and/or organic matter. Elemental analysis showed high values of S, Cl, and K in patch soils with respect to inter-patch soils. The proposed FTIR method was useful to compare soil mineralogy in specific areas. Fertile spots by accumulation of water, soluble salts and sediments may favor plant growth in semi-arid regions and these plants may increase the fertility of the spot. 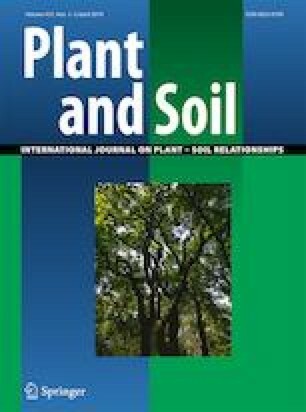 Changes in soil mineral composition could be used to monitor the biological activity of soil in arid and semi-arid zones. Research funded by the Spanish Ministry of Science and Innovation (projects UNCROACH, CGL2011–30581- C02–01 and GRACCIE Programa Consolider-Ingenio 2010, CSD2007–00067), Spanish Ministry of the Environment, Rural and Marine Areas (Project RECUVES; 077/RN08/04.1) and Generalitat Valenciana (Programa G. Forteza; FPA/2009/029).